Whether it’s a single pool or multiple bodies of water, there are several essential factors to consider when planning an aquatics environment. Taking the time to step back and look at how the space will be used, and who it will used by, can help determine the overall layout and degree of flexibility required for the space. Who are your actual users and what are their needs and requirements? In parallel with these basic drivers, overall quality is critical in the success of any aquatics environment. 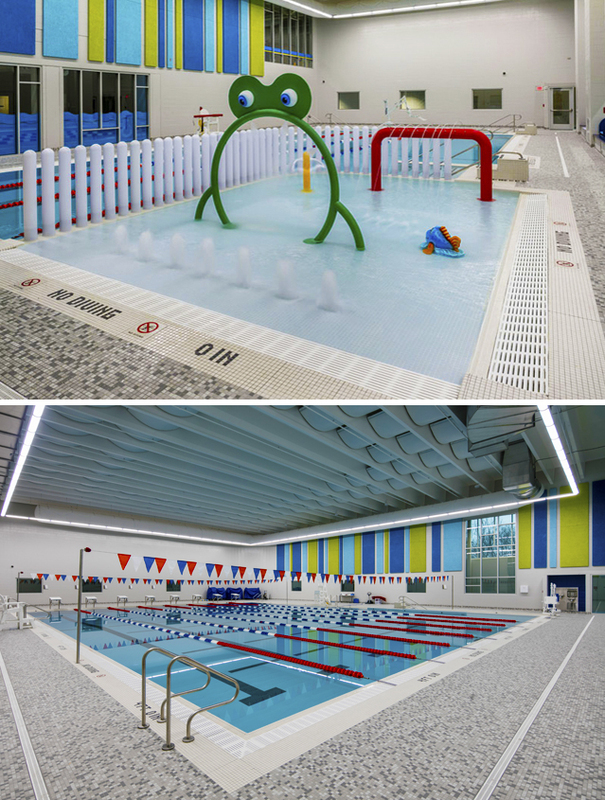 One of our recent projects, the Mary Free Bed YMCA, had multiple stakeholders that would be utilizing the pools. Since the needs were so broad, both a lap pool and a warm water family pool, with an additional 20-person whirlpool, were included in the design. This article will focus on the lap pool and the unique factors, including an adherence to principles of universal design, which drove the design of the pool area. 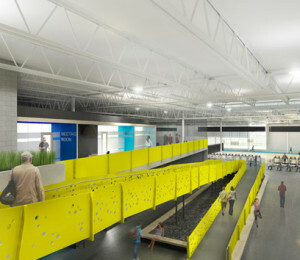 The family pool (left) and lap pool (right) are both important parts of the Mary Free Bed YMCA aquatics environement. 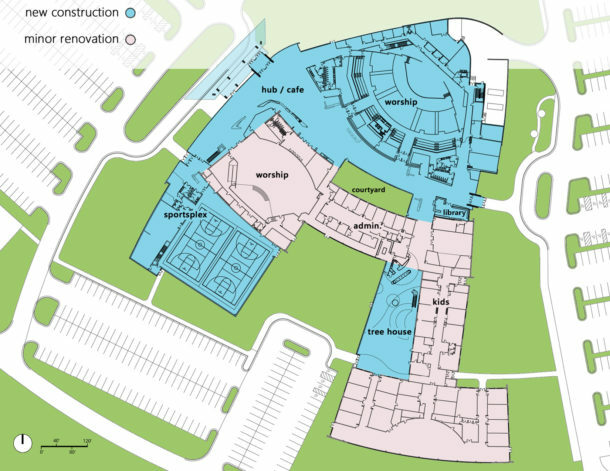 The two pools allow the facility to meet the needs of most users. 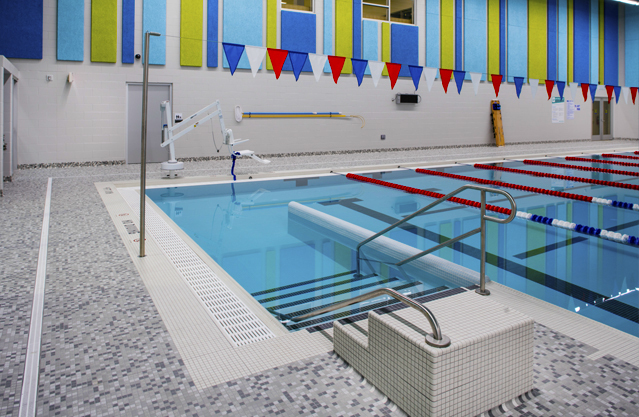 The collaboration between the YMCA of Greater Grand Rapids and Mary Free Bed Rehabilitation Hospital, meant that this pool would need to embrace both people with and without disabilities. Programs included learn-to-swim, scuba diving, water aerobics, lap swimming and a practice and competition space for a regionally renowned swim team called the RAYS. In consideration of these uses, the pool was designed with an utmost flexibility. For example, lane line anchors were installed in both directions so that the pool could quickly be converted to either a 25-yard or 20-yard pool. This would allow for additional lanes based on the number of users. There are a number of components that impact the quality of the space, most of which are not seen. Ask any swimmer, “how does the water feel? Is it fast or slow?” The question and answer are simple ones, but they are a result of a number of choices made by the design team. These choices affect the water, air, lighting and acoustical challenges within the pool enclosure. At the YMCA we chose to supplement the chlorine treatment system with an ultraviolet sanitation system that provides an additional level of disinfection by emitting a high intensity germicidal light ray that disrupts the DNA or RNA of targeted organisms. It also helps to destroy organic matter eliminating the formation of dangerous chlorine by-products. Air quality is of the utmost importance in an enclosed pool environment. The strong chlorine odor at many pools is caused by chloramines, not free chlorine. Chloramines have a number of negative impacts. They reduce the disinfectant power of free chlorine, cause irritation to eyes and can have negative impacts on a person’s respiratory system. Chloramines, when given off from a pool in the form of gas, will dissolve back into a pool unless removed by the ventilation system. The solution we developed for the YMCA was to supply air high up, near the ceiling at one side of the pool, with a return near the ground at the pool’s opposite end. This ventilation strategy provides an intentional air flow that pulls fresh air across the water surface. The fresh air helps remove any chloramine contaminated air and provides better air quality and experiences for the swimmers. Acoustics are an issue within all pool areas because surfaces are typically hard which cause sound to echo or reverberate. In other words, sound waves have no place to dissipate. 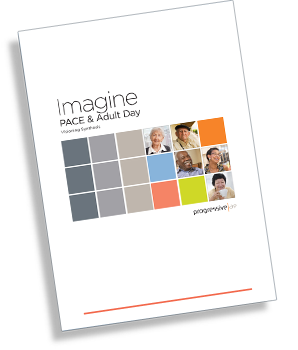 For people with hearing impairments, and even those without, communication becomes difficult on all levels. Think of coaches trying to give instruction, teachers instructing a group of children, or seniors staying on cue with a water aerobics class. During the design process, an acoustical analysis determined the need for sound absorbing materials on the ceiling and walls. On two of the walls we provided 2-inch thick Tetum panels while also using 2-inch Lapendary ceiling acoustical panels that were suspended in a catenary fashion. 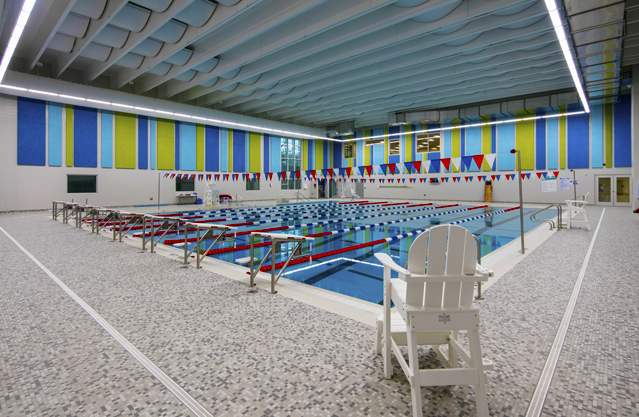 The lap pool’s paneling along the walls and ceiling help absorb sound and make hearing easier. 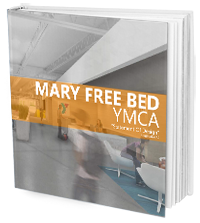 As the first adopter of the GUDC (Global Universal Design Commission) guidelines, the Mary Free Bed YMCA pools included a number of important universal design components. Going beyond the code-required pool lift, we designed a tiled transfer station that allows people with disabilities an independent way to enter and exit the water. Access to the pool environment is easy with power-activated doors and no thresholds. A color contrasting tile pool edge helps individuals better navigate the water’s edge. Another simply strategy employed was the use of color contrasting lane lines and flags that alert pool users as they approach the end of the pool. The lap pool features a lift and tiled transfer station. These two features allow people with disabilities to independently use the pool. The design for the Mary Free Bed YMCA lap pool was an integrated solution that included considerations around lighting, acoustics, ventilation and water treatment systems. The design concept for creating an inclusive, dynamic environment was based on universal design principles and promoting equitable use and accessibility by everyone. Learn more about universal design.